During 1933, Nelson Marshall Cooke (1904-1963) and his wife, Philomena Mary, nee Kenway, (1905-1992) arrived in Petrie to enter into business as general storekeepers. The couple were married on 4 February of that year, and it would appear that they made their first purchase of Petrie real estate only two months later. 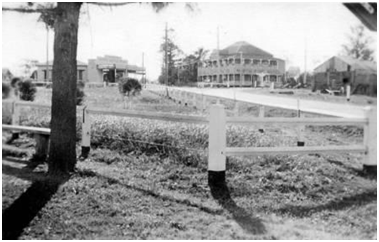 At the time, there were two general stores operating in Petrie, one located on the south-eastern corner of the Old Dayboro Road intersection with River Street on the site of Hamilton’s first store later operated by the Osborne family, and the other, previously known as Twible’s store, was not far to the east on the southern side of River Street opposite the North Pine Hotel where Cooke Street is now located. The Cookes purchased both stores and briefly operated them until 1936 when the new road into Petrie was opened. It was near today’s roundabout, at what became known as Cooke’s Corner, that the family established a new general store. Some of the timber from the previous stores was used in the construction of the new building. 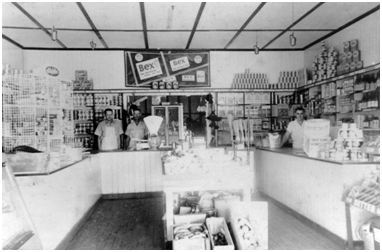 Until the late 1940s, the Cooke’s shop remained the only general store in Petrie. Around about 1966, a few years after Nelson’s death, the family sold the lease of the general store to Alan Dalton, but they retained ownership of a considerable amount of property and Mrs. Cooke continued to run a drapery business and a newsagency for several years. With the sale of their property at Cooke’s Corner on 22 September 2003, the Cooke family finally put an end to seventy years of association with the history of Petrie. Courtesy of William Oswald John Kielly. Interior of Cooke’s Store, 1953.